This product often applies to auto remove the seeper at the lower places of piping, frozen type air drying machine, oil separator, air storage tanks and the bottom of various air filters. 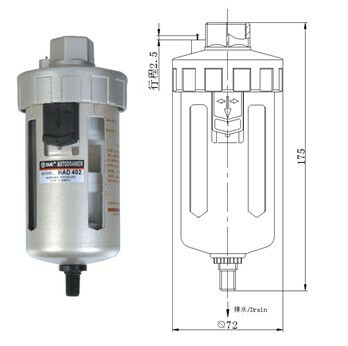 It can be installed in the places inconvenient for manual discharge sewage, such as higher, lower and narrow places, especially there's large consumption of air or frequent water drains. It can prevent the compressed air being re-polluted by condense water resulting from neglect of manual drain. The water cup is provided with metal prective cover. When using, the drainer should be installed vertically the drain port facing down.